Scratch Factory: Homebrew: galaxy sky and skull moon? Homebrew: galaxy sky and skull moon? I've always been a guy who's imagination is sparked by vivid images. There's an image that's been in my head for over twenty years now, after first seeing it in a children's book about astronomy... when I was a child, appropriately enough. After looking for years for this book, the artist, or an online version of this picture, I stumbled across a good condition copy of the book in a used bookstore a coupla years ago, completely by accident. I scanned the one image in question, and I'll be posting it shortly, but my question is: if you were to integrate this image into your fantasy setting, what would you do with it? Clearly, the image is a view from a planet outside of a large spiral galaxy more or less like the Milky Way. Perhaps the planet belongs to a solar system in a satellite minor galaxy, like one of the Magellanic Clouds, or perhaps it's merely a rogue star traveling through space completely on its own, yet close enough to a large spiral that on some evenings, when the moon is below the horizon or new, allowing for little light pollution in the sky, the spiral arms of a giant whirlpool galaxy fills the night sky. Contrary to what you sometimes see in the movies, it's absurd to suggest you could actually see this rotating; the Milky Way, for example, has a radius of approximately 50,000 light years. The speed at which the outer arms would have to be moving in order to show visible rotation to someone outside is absolutely staggering... not to mention physically impossible. That doesn't mean that this would necessarily be a welcome sight in the sky. I imagine that folks would see this like the whirlpool that it resembles; they would fear the galaxy in the sky, and see it as evidence of the inevitable destruction of their world, it's final days to be sucked into the Void. Anyway, I'm asking directly; any other ideas? Please post 'em! Meanwhile, I've got another idea for a sign in the sky. Our own moon, at least on the side that's visible to Earth (the moon is tidally locked, so we only ever see one side of the moon... but you already knew that, I'm sure) is covered with the remnants of vast, prehistoric lava flows. These lava flows stand out as darker gray "seas", or maria against the silvery color of the rest of the moon. If you look at the full moon long enough, and have a little imagination, you might be able to think that you see images in the pattern of the maria. This is the so-called man in the moon. But what if it wasn't a question of being imaginative? What if the pattern of the moon's "seas" made a very obvious design that anyone could see and interpret? And what if this pattern were a symbol of death? 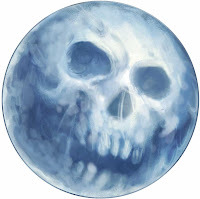 This picture was posted on the Paizo blog (or somewhere on Paizo anyway; I did a google image search to find it) is what I mean; a fantasy moon that looks like a gigantic silvery skull. What would happen in such a world when the moon is full? Another direct question: any ideas? I kinda imagine what the ancient druids and later medieval peasants thought Halloween was; a night when spirits ran unfettered through the night, could be not just a yearly event, but a monthly one. The full moon is the night of the undead. But, that's a bit obvious. Any better notions? Post 'em! I should offer some kind of prize to the person with the best ideas here or something, because otherwise I probably won't get any comments, but y'know what? I'm really cheap. So I'm not gonna. But seriously; please post your ideas here. That galaxy image remind me of a moment in the Prince of Egypt, when the sky is *punctured* and God's will slips through, harvesting the firstborn of Egypt. So this image evokes, to me, an actual hole in existence, with the light of Heaven shining through. As for moons, I like the Egyptian myth (notice a theme here?) where the sun and the moon are the eyes of Horus, with the moon being the eye that Set put out. I haven't really highlighted this in my online POL campaign, but my idea is that the moon in my campaign actually is blueish-green-white - in fact, it is a habitable planet. I haven't really decided yet what this means or what will happen with that. Maybe something terrible will happen there? The spiral galaxy might be called the "eye of god" or something? I don't really know, but it's possible that the rest of the starfield would contain one or more other galaxies - maybe smaller, but still recognizable. I wonder if this might change the opinion of people what individual stars are? Maybe they actually think they are all spiral galaxies, just very far away? And they might be right if the planet is really isolated and not part of a larger star system / galaxy. The shape of the moon might be result of a terrible ritual in the past. And every full moon, the undead rise from the grave, still trying to follow the orders of a dreaded necromancer long dead and disposed by a band of heroes... Or following the orders of the rightful king of the empire? Y'know, the surrounding starfield is an interesting question. If the star is in a smaller satellite galaxy, a la the Magellanic Clouds, then there would be a normal starfield superimposed over the galaxy and around it. Otherwise, there will be essentially no stars in the background. You'd probably be able to see small spirals and smudges of galaxies in the very far distance, but exactly how visible they'd be with the naked eye is debateable. Certainly we can't see much in our sky now, but that's partly because of the "light pollution" of all the stars and dust in our own galaxy surrounding us. The thing about the galaxy is that thing is BRIGHT. Easily as bright as the moon, at least in that picture. And it won't be running all over the sky like the moon does, or waxing and waning. It's just hanging there every night, dipping towards the horizon every winter and rising up again every summer. I should think astronomical rituals take on great importance. So your nights are never really that dark except when it's cloudy. So essentially werewolves/vampires are savage man-beasts that drink your blood to live forever (like they were in traditional Romanian folklore?). I like that! None of that suave, seductive Anne Rice crap. Which leads to no sparkling! D&D has a terrible habit of splitting out slightly different aspects of the same folkloric tradition and making it something else entirely. I don't see any reason why werewolves and vampires can't be essentially the same creature, or why there can't be more variety in how a vampire appears, manifests, or what supernatural abilities and whatnot it has. In any case, I think I had in mind a kind of ghostly Wild Hunt when the moon is full, but I like the lycanthrope/vampire connection a lot too. I've been told the Milky Way would be visible from a star system on the outside of one of the Melagenic clouds (which I probably spelled wrong). It would be more on the side though. If you're going high fantasy, your star system could be wherever you wanted. Maybe the entire star system is in slight phase/overlap with our own universe only the relative location is in the middle of nowhere on a galactic scale ... so you can get your full frontal of the Milky Way. 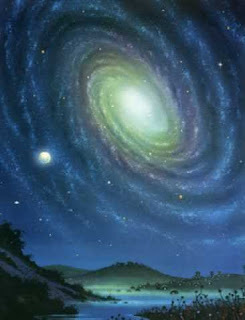 The Milky Way rotates every 225 million years. What if the citizens of your phased star system saw it rotate once every 225 years? Their timeline would be chugging forward 1 year for every million of ours. So if our universe is 14 billion years old, their universe would be 14,000,000,000,000 or fourteen thousand trillion years old. Gosh. A possible campaign idea is that the phased star system has only been like that since INSERT EVENT HERE (IEH) and the citizens have seen the Milky Way slowly rotate ever since. Our universe has just enough hold on them that they'll be in big trouble when our universe eventually ends. They'll need to bring their universe back in sync before our universe 7.5 billion years from now ... or 7,500 years for their time. Hmmm. Maybe their universe could be going even slower? Or maybe the 7.5k timeline works out fine. Enough to put the scare into everyone, but not enough so that if the PCs fail, the world dies. Or your moon bad guy could be in charge of it all. Hmmm. Maybe he's creating yet another universe. He needs the phased universe out of phase so that he can get his universe to maybe the 3 billion year mark (3,000 years for phased) when his endless supply of minions will have evolved. The surface of the moon isn't really a moon, its the shell of another universe and it's going to pop and out will come the evil hordes like a stripper popping out of a birthday cake ... actually that's a rather lousy analogy. PS that's the first picture I've seen of Claudio in years. When the hell did he get gray hair? Also, why is he *still* better looking than me? For very specific values of "successful", of course. If only the frakkin' website would run reliably, I might be able to successfully conclude it, even.